L'il Seabreeze is just the right size for a small family. Comfortable and kid friendly this Nags Head vacation home features three bedrooms and two full baths. This is a Nags Head vacation home in the old style tradition...what we fondly call a "classic". 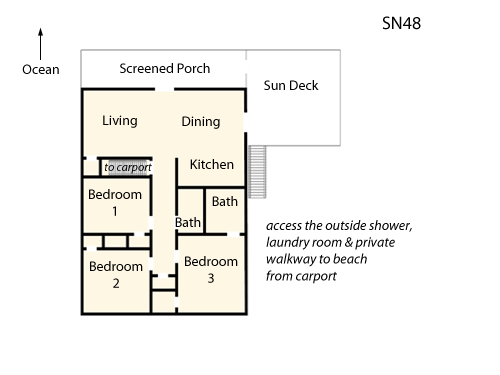 In addition to the wonderful ocean views there is a screened porch and a sun deck. L'il Seabreeze is located on the oceanfront in South Nags Head...and features spectacular views. What makes South Nags Head special? There are no commercial properties here...you will find a collection of large and small homes, nice beaches and outstanding views. South Nags Head is a perfect place to bike, walk or just relax. It is a short drive to Roanoke Island where we encourage you to take in a performance of the Lost Colony Outdoor Drama if you are here during the summer months. The OBX is known for great food and nearby are some excellent Outer Banks Restaurants. We recommend Owens, Lone Cedar, Sugar Creek, Sam and Omies. had a great week!!! awesome house, wonderful weather, great seafood! see you next year!! !